I don’t always write a review for the books I read, mostly because there’s a theme to whatever winds up on ye auld book blog, but I’m making an exception for this book. It’s highly possible that some of y’all are fellow StarCraft fans and if you are, well, have I got the book for you! 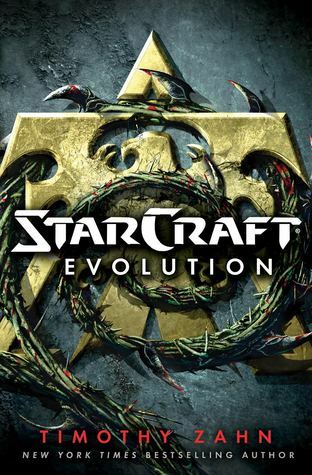 Penned by the legendary Timothy Zahn (mostly of Star Wars now-Legends-universe fame), StarCraft: Evolution takes place some time after the events of StarCraft II. Players of the game will recognize some very familiar characters from the game who play very key roles alongside our newer set of characters that the great Zahn has brought to life. Sadly (or poetically), Jim and Kerrigan are not featured in the book (because GAME SPOILERS). Still, in spite of that, we have a rip-roaring StarCraft adventure that I swear they should turn into additional mission packs or expansions because the story is just so good! *cue movie trailer narrator voice* In a galaxy devastated by a three sided war between Noble Protoss, Savage Zerg and the united Human Race, a chance at lasting peace presents itself when OverQueen Zagara offers the Terrans under Emperor Valerian Mengsk a chance to rebuild all that has been broken and burned. Hierarch Artanis doubts the proverbial olive branch but reserves judgement until all evidence can be presented. An away team consisting of a Marine, a reaper, a xeno-biologist, a ghost and a Protoss researcher is sent to validate Zagara’s claims that the Zerg can can indeed seed life as the once fabled Xel’naga used to. But when the away team are attacked by Zerg, the Terrans and Protoss have a choice to either believe that Zagara is indeed innocent of these attacks or is playing a deeper, more sinister game. Will the away team find uncover the true mystery behind the attacks before another all out war begins? Read the book and join me in wishing so bad they make this part of the actual game!